Click an available state below to view the current quarter’s Top 10 Rankings for that state. Please contact us if you are interested in obtaining a complete Report for your state or for information on custom or historical Reports. For your convenience, we have eReports (pdf & excel) available for immediate delivery via email for many states. Reports are produced on a quarterly basis, and are distributed to clients during the months of February (4Q), May (1Q), August (2Q), and November (3Q). We welcome any questions or comments you may have regarding the Bank Performance Reports. Board of Directors will value this information. The Report is simple and clear, and easily understood. Senior Management should receive a copy quarterly for review. Schedule a follow-up meeting and challenge Management to bring one or two suggestions to the table based on the Report. Review the Competition closely. Relative Yield, Cost and Growth are important elements for successful performance. Watch the Ranking over time. It may not be great to 40th, but if you were 60th last year, that’s a good thing. Use the eReport to sort down your market or region, and then build new medians for performance. Net Interest Income and Non-Interest Income Rankings are on the revenue side. View them together for an understanding of Total Revenue. Non-Interest Expense and Efficiency Ratio Rankings are expense side for a better understanding of cost controls per size and per revenue. Asset Quality Index and NPA’s/Equity (the Texas Ratio) Rankings both give valuable data about overall asset quality relative to your State and your competition. ROA and ROE Rankings give a relative position for your Bank. The change in this Ranking over time is critical. The Report can be the basis for a valuable press release. Top Rankings are important information, and should be used effectively for marketing. 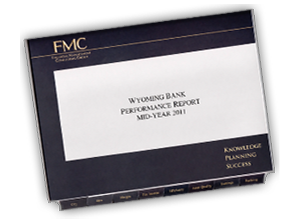 Performance Reports can be an excellent tool and foundation for strategic planning. Performance Reports can be an excellent means of tracking strategic progress. Performance Reports can be helpful with incentive compensation programs.